Very often we get asked to look at photos that friends and family in the hotel trade have taken in an effort to get images for their website and brochures. 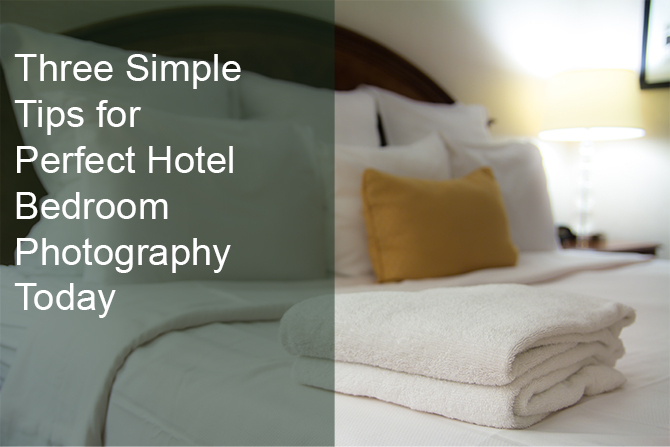 There’s nothing wrong with going it alone if you’re a small hotel, the cost of professional photography can be expensive, so it’s no wonder that many owners do it themselves. The cost of designing, printing and distributing brochures is high enough, so if you can save money somewhere, then it’s worth doing so. However, professionals have been doing this for a while, do they’ve managed to pick up a few secrets and ideas that can make even photography done on the cheap look good. Here are a few ideas that can make a huge difference to your end results. This might sound crazy, but I’ve seen some people taking photos with their phones, and while it might look OK when viewing them on a 4-inch screen when it comes to print, most camera phones are lacking the quality necessary. If you can, beg, borrow or steal (OK, don’t steal) a digital SLR camera. You can use a tripod to get the best picture possible. You might think you’ve got steady hands, but honestly, they’re probably not steady enough and many phones don’t have the optical image stabilisation necessary to do a decent job. You ideally need to be shooting RAW. No, that doesn’t mean in your birthday suit, it means you are using data from the image sensor that has been barely processed, or not processed at all. For example, if you take a photo and store it immediately as Jpeg, the most common image format, then you’re throwing away a lot of image data. You won’t get all the whites, all the blacks and the hues and shades won’t be quite right. This is because Jpeg compresses the image to make them smaller. This is necessary on a phone and on some cameras without lots of memory, and it might look good, even when printed out. But it won’t be perfect. If you’re sending your images off to a graphic designer to work into a brochure, you really want them to be the best possible quality. The lens just won’t be good enough. Sure, you’ll have a lot of megapixels, but the number of pixels in your images isn’t everything. The lens of a camera is one of the (some would say the) most important parts of the whole setup. A good lens can make an average camera perform way above what you’d expect. Just look at the lens of the average SLR, it’s huge compared to what you’ll ever see on a mobile phone, and for good reason. They’re precisely engineered, meticulously designed and will give you far more options when framing that perfect shot. Have you noticed that every picture of a Big Mac hamburger is absolutely perfect? Have you ever had one that has ever looked like the one in the picture? Of course, you haven’t, they don’t look like that when they’re prepared by a three-star teenager at the back of the restaurant. It doesn’t matter at that point; it’s just fuel. However pictures are prepared with great detail to give the best impression, and you should do the same with your hotel room, especially the linen. If you have a room that you’re about to photograph, get the very best pillows, pillow cases, and duvets, iron the sheets, steam the curtains, and most of all, check out those bed skirts. The bed skirts are the type of thing you only notice when the photo has made it all the way to the printer, and you’re just looking at the first of 10,000 copies. Check them for stains, spots and creases. Check for frayed threads, rips and even where they might be uneven. They absolutely must look perfect, otherwise your results will be sadly lacking. People really like fruit. Sounds crazy, but they do, they promote health, they push a sense of well-being, and importantly, a good variety of fruit will also add colour to a room. Juice really red apples, vivid oranges and make sure bananas are yellow and ripe, but without any brown bits. And finally, a thought about the use of PhotoShop. If you check the photography forums, you’ll see lots of people asking for ‘experts’ to fix their photography errors. Sometimes the results are hilarious, but sometimes someone can make a good photo out of a bad one, but it shouldn’t be relied upon. Image editing tools are not the answer to bad photography. Get it right up front, and you’ll save yourself an awful lot of time later.